Huawei on Thursday said it has developed new battery charging technology that will make time spent sitting at the outlet a thing of the past. It should be great news for several markets, particularly wearables and smartphones. Huawei said the new technology, unveiled at the 56th Battery Symposium in Japan, can charge up to ten times faster than a traditional battery. That means you might expect to juice up something with a 600mAh battery, such as a wearable, to a 68% charge in just two minutes. For today’s recent crop of smartwatches, that might mean a day of use or more, all from just two minutes at the outlet. Even cooler? Huawei says the tech can charge a 3,000mAh battery, something that you’d find in a phablet, to a 48 percent charge in about 5 minutes. 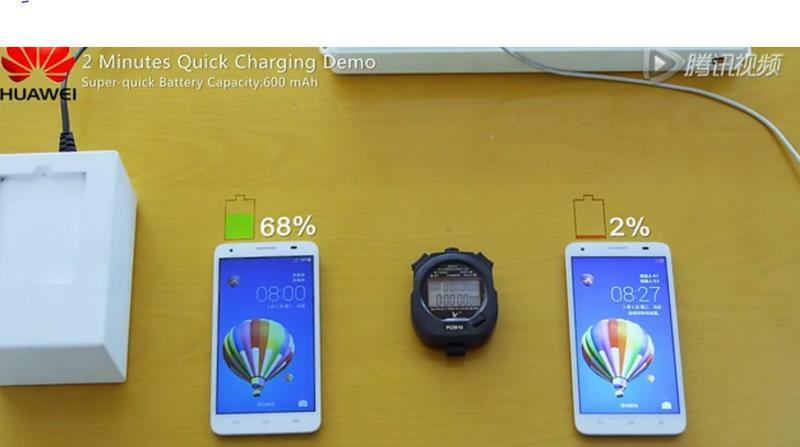 And we thought Qualcomm Quick Charge and Samsung Adaptive Fast Charging were speedy. The new technology, which Huawei promises doesn’t affect battery life, takes advantage of hectometers that are bonded to a molecule of graphite in anode. This, Huawei says, can be a “catalyst for the capture and transmission of lithium through carbon bonds,” which helps boost the speed it takes to charge a battery. The firm is working with partners to try to bring the new batteries to market. Hit the source for two videos that show the charging in action.